The skeptical cardiologist has had a few patients undergo stem cell injections for knee osteoarthritis. My sense based on a brief look at the literature in this area was that these stem cell clinics were unproven and over-priced. They typically cost 5 or 6 thousand dollars an injection, are minimally effective (no better than placebo injections), and are not covered by insurance. 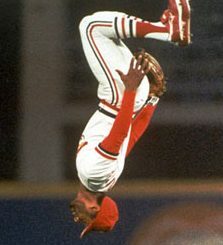 I felt compelled to research the area more deeply when I discovered that Ozzie Smith, the Hall of Fame former Cardinal shortstop, had his name attached to a stem cell clinic in St. Louis and actively promoted it on their website. Ozzie, heretofore, my favorite Cardinal, auctioned off his 13 Gold Gloves and 11 All-Star Game rings in 2012 and now, sadly, is lending his name to a shady area of pseudoscientific medicine. In the course of my research I came across an incredibly detailed well-written and researched article posted on John Byrne, MD’s Skeptical Medicine website entitled Dubious Stem Cell Clinics. After reading Byrne’s article I realized that there was no purpose in proceeding any further with my own research-this is what I would post if I had the requisite time, intelligence and skill-so I hope all will read the original. , as of 2018, the only legitimate stem cell treatments used in clinical practice are in bone marrow transplantation, burn treatment, bone grafting in orthopedics and corneal generation from limbal stem cells in ophthalmology. And of those, only bone marrow transplantation in cancer patients has a consensus from large scale clinical trials. There currently are no other legitimate treatments that are warranted for general use by current science. We simply are not at that level. However, such limitations do not prevent contemporary snake-oil salesmen from selling dubious treatments to desperate people by making unwarranted claims about stem cell therapies. “Stem Cell” is the new “Magnetic” and “Quantum” in the world of quackery.As with many scams, it is sold using “sciency” words and riding on the coattails of legitimate science. Graham Parker, Ph.D., Jeanne F. Loring, Ph.D.
Byrne goes on to give the history of stem cells, discuss the types of stem cells and why translation of their promise to clinical results has been slow. With the promise of what sounds like a magic technology, these clinics offer treatments for conditions across a wide range including orthopedics, pain management, neurologic problems, immune diseases, respiratory diseases, urologic, sexual, cosmetic, cardiovascular and dermatologic disorders. They advertise treatments for aging, diabetes, hair loss, muscular dystrophy, vision problems, gastrointestinal disorders, Alzheimer’s and autism. Products are on sale now promoting magical-sounding claims of skin rejuvenation with the words “stem cell” attached to their names. Many products promote plant-based stem cell creams (yes, you read that correctly). One company’s advertisement claims, “(our) cutting edge technology brings an innovative anti-aging skin care line. Plant stem cells are the source of unlimited energy and the key to herbal growth and regeneration”. Many sites use the language of pseudoscience to make specific-sounding claims, but in reality, are vacuous. Motor City StemCell claims that their products “Control the immune system”, “regulate inflammation” and “provide trophic support”. The operative words here are “control”, “regulate”, and “supports”. Skeptics recognize these as “weasel words”. They do not make specific claims for which the claimants may be held to account. Other weasel words include “boosts” and “enhances”. products and services; attack your critics as being closed minded, or in the pocket of “Big Pharma”; repeat. Stem Cell research is a promising field. There may be a day in the future in which there are many disorders that can be effectively and safely treated with stem cell therapy. That day is not here yet. However, we currently have many clinics across the world offering treatments under the guise of “Stem Cell Therapy”. Their claims go well beyond the current science and are therefore not justified. These treatments are not regulated or endorsed by agencies such as the FDA. The consumer will pay large sums of money — tens or hundreds of thousands of dollars — to receive unproven, unregulated “treatments” at their own expense, often under the guise of a “clinical trial”. No legitimate research organization charges participants to participate in clinical trials. These treatments have unknown risks and unproven benefits. 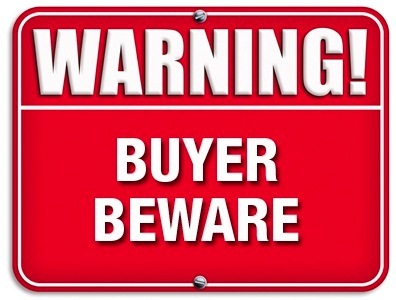 They are marketed with fancy websites, testimonials and expensive dinner seminars by providers — some of whom are actual MD’s or DO’s and should know better — with no regard to scientific standards or ethics. They will use scientific-style jargon and promise miraculous cures for just about anything that ails you. This is a scam. Yes, indeed this is a scam. 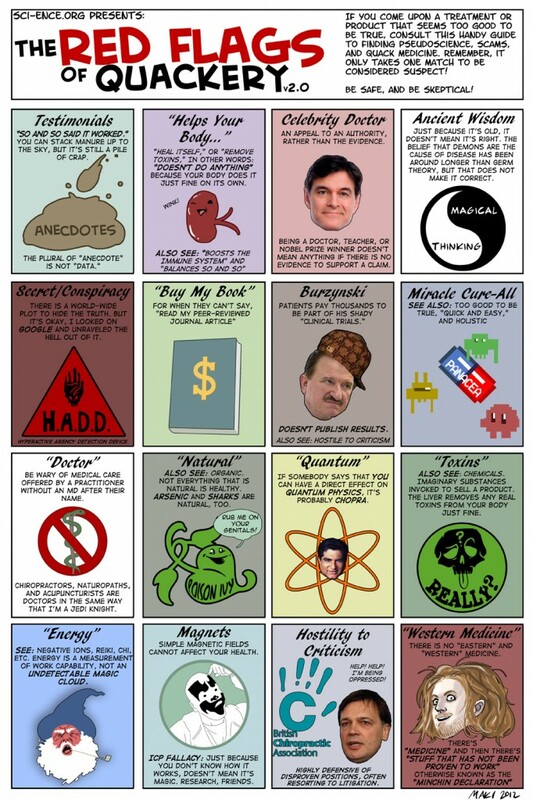 And we will have to add some of these attributes to my #1 red flag of quackery. Weasel words and the Quack Miranda Statement are definitely highly specific markers for quack web health sites. 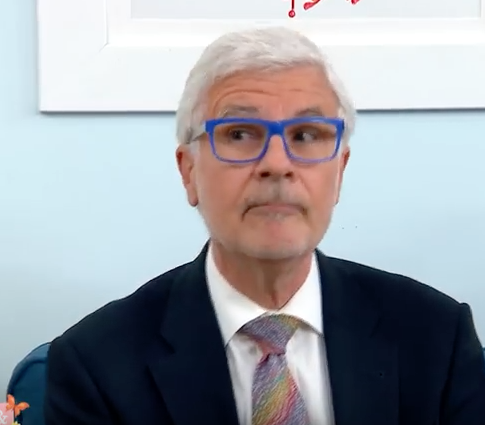 The skeptical cardiologist first encountered the blather of Dr. Steven Gundry while researching and writing a post entitled The #1 Red Flag of Quackery. Gundry is also a Goop doctor, which means Gwyneth Paltrow, the celebrity queen of weird quackery endorses him. I’ve been meaning to write specifically about his most popular useless supplement, Vital Reds. In the meantime, Gundry has come out with a best-selling. book entitled “The Plant Paradox: The Hidden Dangers in Healthy Foods That Cause Disease and Weight Gain”. This book claims to reveal to its readers the great dietary “secret” that is causing almost all chronic diseases. Of course, Gundry is the only person with the brilliance and insight to have recognized this. Only those who are willing to plunk down the money to buy his book will learn this secret and the (mostly gobbledook) science behind it. This technique of convincing the naive that only you are aware of the “hidden” factor which is the cause of their various maladies can probably be considered the #2 Red Flag of Quackery. The Plant Paradox would have you believe that lectins are the major danger in our diet. I’ve come across two well-researched pieces which destroy any validity to the concepts put forth by Gundry in The Plant Paradox. Campbell: Is It Possible Gundry Is Out To Make A Quick Buck? Are Lectins The Next Gluten? The second article I highly recommend was written for The Atlantic last year by one of my favorite medical writers, James Hamblin, MD. Entitled, “Lectins Could Become the Next Gluten“, the article combines a tongue–in-cheek commentary with interviews with scientists who debunk Gundry’s claims. Hamblin also interviews Gundry which is particularly revelatory as to Gundry’s lack of credibility. The GundryMD line of products includes something he invented called vitamin G6. Another is a “lectin shield” that’s “designed to neutralize the effects of lectins.” These are available on his website for $79.99. There you can also get six jars of Vital Reds for $254.70. Hambling closes his piece by noting that book publishers have no accountability for publishing dietary/health misinformation as they are incentivized to publish and profit from the most outrageous claims. This is a problem much bigger than any plant protein. Cycles of fad dieting and insidious misinformation undermine both public health and understanding of how science works, giving way to a sense of chaos. It seems that every doctor has their own opinion about how to protect your body from calamity, and all are equally valid, because nothing is ever truly known. N.B. 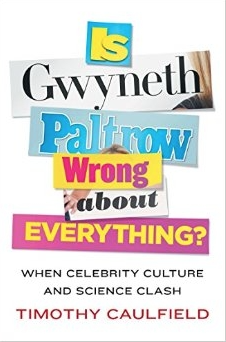 Gwyneth Paltrow (GOOP) deserves a prominent place in the Quackery Hall of Shame. The skeptical cardiologis, like all advocates of science-based medicine, knows that “integrative” medicine integrates quackery into real medicine. In many respects quackery and integrative medicine are to real medicine as fake news is to real news. Originally known as quackery, the modalities now being “integrated” with medicine then became “complementary and alternative medicine” (CAM), a term that is still often used. But that wasn’t enough. The word “complementary” implies a subordinate position, in which the CAM is not the “real” medicine, the necessary medicine, but is just there as “icing on the cake.” The term “integrative medicine” eliminates that problem and facilitates a narrative in which integrative medicine is the “best of both worlds” (from the perspective of CAM practitioners and advocates). Integrative medicine has become a brand, a marketing term, disguised as a bogus specialty. A lot of it is based on prescientific ideas of how the human body and disease work (e.g., traditional Chinese medicine, especially acupuncture, for instance, which is based on a belief system that very much resembles the four humors in ancient “Western” or European medicine); on nonexistent body structures or functions (e.g., chiropractic and subluxations, reflexology and a link between areas on the palms of the hands and soles of the feet that “map” to organs; craniosacral therapy and “craniosacral rhythms”); or vitalism (e.g., homeopathy, “energy medicine,” such as reiki, therapeutic touch, and the like). Often there are completely pseudoscientific ideas whose quackiness is easy to explain to an educated layperson, like homeopathy. “there are modalities being “integrated” into medicine whose quackiness is not so easy to explain. Perhaps the most popular and famous of these is a specialty known as “functional medicine” (FM) whose foremost practitioner and advocate (in the US, at least) is Mark Hyman, MD, a man whose fame has led him to become a trusted medical advisor to Bill and Hillary Clinton. Perhaps Hyman’s greatest coup came in 2014, when the Cleveland Clinic Foundation hired him to create an institute dedicated to FM, an effort that has apparently been wildly successful in terms of patient growth. Never mind that around the same time Dr. Hyman teamed up with rabid antivaccine activist Robert F. Kennedy, Jr. to write a book blaming mercury in the thimerosal preservative that used to be in vaccines for causing autism, an idea that was shown long ago to have no scientific merit. During the process of compiling the Cardiology Quackery Hall of Shame, the skeptical cardiologist has recognized that the #1 red flag of quackery is the constant promotion of useless supplements. I received an email today from a reader complimenting me on my post on the lack of science behind Dr. Esselstyn’s plant-based diet. The writer thought I would be interested in the work of a Dr. Gundry. I found on Dr. Gundry’s website an immediate and aggressive attempt to sell lots of supplements with features similar to what I describe above. Need I mention that “holobiotics” is (?are) not real.